Is fear of lifting heavy weights affecting your progress in the gym? You’re not alone! I work with a lot of adults taking up weight lifting for the first time, or coming back to it after decades of not weight lifting. As we get older, we naturally feel more fear and it becomes harder to overcome. We’re told that we need to be confident in order to lift well. We know that we need to maintain our technique and skill even when we’re scared of the weight and of what might go wrong. But that’s easier said than done. So how do we overcome fear of lifting heavy weights? ‘Fear training’ isn’t much talked about in any sport. Athletes are expected to have no fear, or at least not to let it affect them. The problem is that the gap between being scared and being confident can seem impossibly huge. How do you not be scared? Stepping stones are just what they sound like: small steps you can take to get you a little bit closer to confidence. 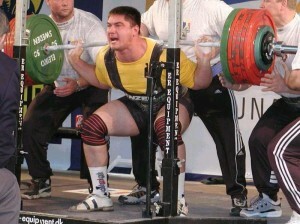 For example, let’s imagine you are going for a one rep max squat and you are scared of the weight. Instead of trying to be utterly confident, start by allowing yourself the possibility of making it. We never want to go into a heavy squat thinking, “I’ll never make this.” That kind of negativity is so limiting, you shouldn’t even contemplate it. But going into a heavy squat thinking, “I’m going to make this!” without being completely convinced about it also doesn’t help. Our mind knows we’re lying to ourselves. That’s why having someone else say “You’ve got this!” is usually more convincing and effective. So having a friend or a coach tell you with sincerity that they believe you can make this lift is a great way to instil confidence. But what if you don’t have this? What if you’re on your own? You need to move from the river bank of I’ll Never Make This, to the stepping stone of I Might Make This. Just be open to the possibility that you could do it. You might, you might not. You won’t know until you’ve had a go. If you can keep an open mind every time you approach a heavy attempt, your rate of success will increase, even without complete confidence. Whether the task is physical or mental, you won’t get better at it unless you practise. It sounds weird, but if you want to think in a certain way, you should practise thinking that way. You should even practise failing! This doesn’t mean putting yourself in danger. As a lifter you should know how to set up your equipment so that there are safety precautions in place – for example, squatting in a squat cage with safety bars set at an appropriate height. In my Ladies Who Lift course we learn this practise from day one. A simple way to practise failing is to put a heavy weight on the bar, say 95% of your best, and then try and get as many reps as possible with it. If it’s a true 95%, you’ll probably fail on the second or third rep. You may even fail on the first rep. It doesn’t matter. What matters is that you go into the lift with the right mindset, open to the possibility of making the lift. Since you’re practising failure, failure is actually success in this context! Top Scottish climber Dave Macleod, one of the few high profile climbers who regularly talks about fear of falling and how to handle it, is an advocate of practise. Practising falling, that is. It’s the rock climber’s equivalent of failing a weight. But he doesn’t just advocate practising a few times. 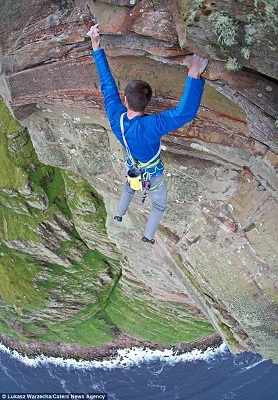 Some climbers will practise falling a handful of times and then just get on with their training. The practise effect may last a day or two but the fear comes back quickly. Macleod advocates hundreds of practise falls. He says that he needed 5-10 falls every single training session for a year, just to break the fear of falling. And that was just the beginning. He needed another couple of years of falling practise to get to the stage where his climbing technique was unaffected by the fear of falling. I believe that the situation is very similar in weightlifting and powerlifting. People are very reluctant to take fails, and avoid taking deliberate fails for practise. This means that the fear never goes away and lifters never learn how to fail well. Weightlifting coach Mike Causer puts a lot of emphasis on learning how to fail. It’s going to happen fairly regularly so it makes sense to learn how to fail ‘well’ rather than get the weight up at any cost. Failing well means committing to the positions you need to get into and trying to get out of them using the right muscles and limbs. Importantly, it also means knowing when and how to dump the bar safely. I know from experience that the only way to avoid doing these things is to practise not doing them in a max or near-max situation. Don’t get practising fails confused with practising technique. Practising technique should mainly be done with moderate weights. But being able to execute a lift perfectly with a moderate weight doesn’t mean you can do the same with 100%+ of your max. Don’t underestimate just how much you need to practise in order to ‘get over’ your fears. In my experience, it takes years, especially if you’re not fortunate enough to have a coach who understands the importance of learning how to fail. It’s helpful not to ‘attack’ the problem or get obsessed by it. I’ve observed this with many of my lifters, and Macleod talks about how this happens to climbers as well. You get so obsessed with ‘conquering’ the fear that the fear becomes this even bigger thing! “You must be careful to maintain attention on the pleasure and satisfaction of [climbing], as opposed to a constant battle against fear. I’ve found that when I accept that practising failure and attempting big weights are part of the sport, and a part that is actually very enjoyable, the fear recedes. I’d be lying if I said it went away completely. I’m still on my fear-banishing journey. But I’ve learned to accept it as part of the game and even sometimes enjoy the feeling of failing, as it gets me closer to my ultimate goal.